Laid-back Syrah… Just what I needed after a long day. Light, foggy, coastal fruit with that flirtatious ghostly edge. Something you need to just speak to you with light blueberry and caramel carousels. I sipped and just thought about the day, honestly, and I have this wine to credit for that. One of the few times where the wine made me forget about the wine– It ORDERED me to forget, just resign myself to the Now I was in. I heard the bottle’s dialogue sing and speak to me through light but convincing texture. It’s a song, a saunter, charm and atmosphere to itself. There was something there in that bottle, in that translation of Syrah, that calculated my consciousness and flew past and around my rationale with unusually understated but poignant dynamism and capability. After three sips I noticed a cherry-like subtle smatter but then it away skipped like a coquettishly phantasmic vixen. I kept sipping. I was done with my day and more relaxed than I could have measured. Not really one who chases Vermentino, but I found this one on a local wine list, at a local restaurant while out to dinner. I didn’t know what to expect but I was irrevocably riveted by all sensory approaches, the paradiddles that sang to the palate… vanilla and orange, lemon and banana, pineapple. This was not a wine that was trying to be safe, or mainstream. It wanted to be honest with its narrative, tell a new turn in Vermentino’s volume and place, character and voice. I kept sipping till dinner, nearly ordered another glass but had to refrain. Been haunted ever since. Wish I would have had just one more glass. What I remember most was the texture of the wine and how it so luminously complimented the flavor complexion. Maybe now I will hunt this varietal, but I’m fearful. How could any other interpretation have this magnetic degree? I don’t want to obsess over that, just want to remember what I tasted, how it taught me something about Vermentino and myself as a wine pursuer. Easily one of the most pedagogical and enveloping white wines I’ve ever encountered. And I have to laugh, as it just found its way to my life, my story, my writing. You can never know what to expect in this wine stage, and Via Giusti’s enigmatically ethereal bottle reminded me of just that. I left the restaurant more than enamored. I was in longing, curious, writing in my head what I’d do if I had a bottle when back home. 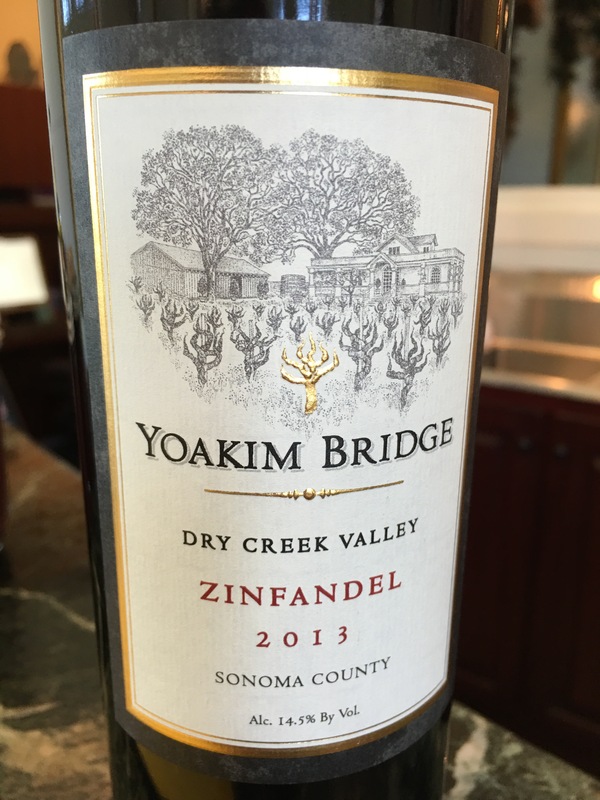 Again exploring my valley, Dry Creek, and en fin decided to stop at Yoakim Bridge Vineyards and Winery. Quaint and contained tasting room with a gentle atmospheric allure that someone like me can only take to, be eager to taste through the flight and further settle into the property and story. Was auspicious enough to have Virginia, one of the owners pour for me. 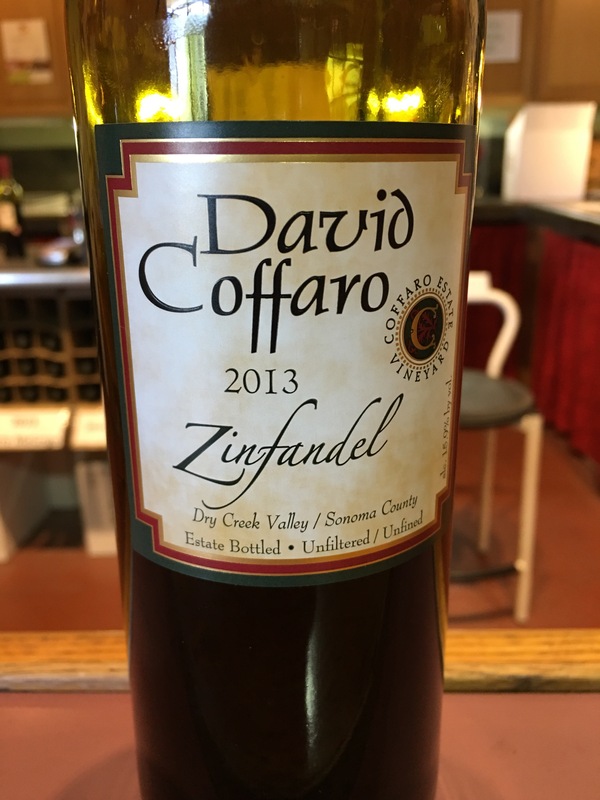 With convivial smiles and bright wooing dialogue she poured the first offering, a 2013 Dry Creek/Sonoma County Zinfandel. Already, the narrative was paginated, that this is a wine producer that couriers not just a ‘sense of place’ as people say about their own wines, but truth of varietal, valley and county, the winery’s inviting octave. Then the same Zin, 2012, transitioning to an ’11 Petite Sirah which has the most resplendent and magnetic initial attractiveness of I think any PS I’ve ever tasted. Then concluding with the Merlot. A 2010 which has a distinguished tasty ardor and accent to its notes and song, general poetry— and oh did it convince me. Had to walk away with a bottle before walking around the vineyard, checking out the Zin vines just outside their little tasting room which felt more like an artisanal boutique of some kind. There’s nothing template about Yoakim, only romantic echoes that will follow you home. And their wines will age, if you’re the character to lay your bottles for a few. I plan on opening my bottle tonight, I’ll be frank. And what will I write to it? One side of me says ‘Has to be poetry” while the other hemisphere screams for inexhaustible paragraph deluge. Anymore, it really is a strain to find any winery that will provoke me to write, buy a bottle take it home and scribble or type further. This little preeminent spot succeeded, with jitterbugging exponents. Could be back tomorrow, who knows… But for tonight I’ll concentrate and center my thinking in the bottle I bought, the stories Virginia told me about her partner, David, how tirelessly he works in the vineyard and during harvest time (her story from ’03), her family and what brought them to Dry Creek. I think of what brought me there, which was all the praise I’d hear around the valley and county, how what I heard aligned not even a little to what I experienced— what transpired between Virginia, Dave, and I in the tasting was so much more enriching. I wasn’t being sold, I wasn’t being taught, I knew people with the same fermented fervor and love as me. And a new place which has beneficially emboldened my wine story and pursuits. Merci! Merci beaucoup! Was told the vineyard blocks and property was inspiring, but I had no conception or way to measure what was my way headed. When vineyards surround you and chant an unusually haunting and encouraging chorus like the Maple Vineyard does, you stop and listen, look around. Day was felicitous in that I and some co-workers and friends had such invitation to listen to Tina Maple speak about her and late-husband Tom’s property. Only selling to four select wineries, they want the integrity of their fruit kept in tact. There were so many seconds and minutes in Tina’s presentation where I wanted to break just for a second from our circle and take pictures, of the rows, of her dogs, the clusters, perceptive and vantage angularities looking up the hill, but no. I had to listen. This New experience had to be fully captured, however I was to do it— by observing, taking pictures, walking around shooting video, however. But more than anything, I wanted to listen to the property’s owner detail the history and the soil composition and how the vines were cared for. She disclosed that at the beginning, where she and Tom bought the property in the 80’s, they had no idea what they were doing, really. But one discovery and fortunate transpiration after another, and Tom’s tectonic interest and curiosity about the their new property, they found themselves to have an opportunity to grow and replant some resplendent fruit. While she spoke I did look around though, and the sight itself and how gripping every turn was, each image and rich specificity that greets your eye is poetic, musical. This is a vineyard that I was meant to see. I always say, “I’m always in the vineyard. I have to be in the vineyard.” With the prominent atmospheric rhetoric and convincing entrapment of this property, now I know what I’ve saying to myself over and over is true. But I know not many of the vineyards I visit or meditate in with have this celestial degree. Not sure where the fruit is in its development and ripening, or maturation, its story, but each cluster looked and tasted prodigious. Each its own paragraph and sonnet, line and language, speaking to me the pursuer and worshipper of vines, soil, site. Sites like this give a writer more sight, more creative rumble about our thinking, urges, visions, where we see ourselves. Tina taking the time to tell us all about her property as well as urging us to walk around and explore, taste the grapes, go check out the Alicante Bouschet in a parcel dubbed “Bill’s Block” could only be described as propitious. Just as she and Tom had their dream, we should all have ours. This vineyard’s uniquely instructional and an endearing shove for wine lovers, winemakers, wine chasers, or writers like me. There’s no way the person who told me the Maple property was “inspiring” could have told me how much. Because places like that can’t be contained to singular words, or thoughts. A visit like this leaves you with an expanding reaction and reflection, sprinting forward into years just as the vineyard itself has— transcending in story and reach. Taste from one of the four wineries to which they sell. You’ll want to walk those rows, too. Reaction: Loved the quiet persuasiveness of the property. No large crowds, just cozy buildings enveloped by Dry Creek’s floor. The tasting room is quaint and concise in its stretch. Jesse poured for me, starting with some Sauvignon blanc, then moving to Rosé and a sparkling. All the reds had voice and character, wanted me to like what they said, each of them, and I did, everything from the Pinot Noir to the side-by-side of the Block 4, ’13 vs. ’14. Just what I expected after all the vaunt I heard from people I know in the industry. I walked around the tasting room a couple times to further take in the atmosphere of that room— barrels and bar, bottles, the music, the pictures, everything. Just what I needed for a new experience in the valley. Speeding through projects but not carelessly. With ardor and an elevated interest that I’ve never seen in Self before. Sticking to my vision of no DC Gen Store for lunch, wanting that intrinsic alchemy shove from hunger. Hem said it was motivation, or discipline. Finding it to be both… Trying to keep an inventory of every creative act today. See how it goes. So far, effective, more motivation. Another call from member, requesting update of information, re-directing shipment. So interesting, all the facets to a winery– club member information to tasting notes, to compliance and shipping, branding and travel, sales goals and all the complexities of… well, everything. Like Debra, the owner here, I’m thinking one day I WILL have my own winery. Sonoma County for sure, Dry Creek or RRV. I’ll decide in time. Lunch– ‘nother winery visit. One I haven’t been to before, David Coffaro. Told it’s good, can’t wait to find out. Experience a new place as a tourist would, pretend I’m not connected, but here for the first time, so eager nd open to everything. I envy these tourists and their plans, and the one doing everything by whim (especially the latter). I start to think and work and imagine with more speed, more creative quickness. Enriched, enlivened, interested in this wine life in way I’ve never been. In being a creative, doubting yourself is death. Plath said in one of her thousands of journal entries that “The worst enemy to creativity is self-doubt.” So, no doubting Self. Ever. This is more than some cheesy manifesto or declaration for me. Another of my favorite authors, as many or probably all of you know, is Jack Kerouac. One of the first bombs of urgency that he projects at us comes in the inaugural chapters, “The only people for me are the mad ones…” Mad people don’t ever doubt themselves, they just do what they do, and with mad beauty, mad effulgence and placement. Today is Friday, but not for me, as I work tomorrow. I’m working today at the winery but I only feel a push, a creative shove that will keep me creating and walking around the vineyard blocks staying motivated, decided. And what have I decided? To create, teach creatively, share what I’ve learned creatively. Frankly, doubting yourself is death to any forward. I’m not hoping to be a motivational anything. Certainly not “speaker”, or … anything. I’m just sharing what I learn. THAT, is my pedagogy. Positivity is not optional. The creative act is contingent upon a dominant positive and yay-saying disposition that visible in all creative work. My 3 pages today, sharing what I learn as I learn it. 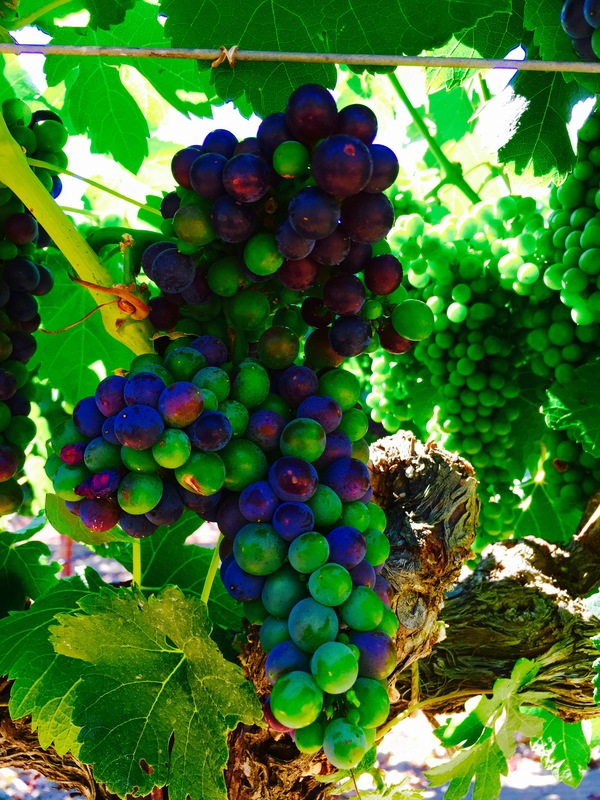 Just now, as I walked in, I saw a cluster of grapes going through veraison, just the beginning stages, very beginning steps toward ripeness. In my head I thought, “I need to get inside, clock in!” But what I did, just stop, enjoy that moment and focus on and enjoy the varying shades of green, deep purple and light purple, that purplish-pink, light red. I took a couple breaths for me. Yes, I’ve written about breathing before, but those breaths just outside this building (house, actually), made me feel strong, confident, dousing doubt in weight more mightier than itself. It was like those burning stars Kerouac talked about in that part of ‘Road’. Burning, Roman candles, wanting everything right then and there. The feeling followed me in here— and I sit here a creatively animalistic mammoth of this new teaching mode. Another lesson from this morning: Graduating. The act of graduating is not just in school or academic contexts. You move from one page to another, one geography to next, moving upward hopefully and not in an exhaustive lateral. Two students of mine, past ones from just this last Spring, are currently at their school of transfer, UC Santa Cruz. They’re excited, you can tell, eager to start the new Newness before them. I know what that feels like and I want it again and again, again, and I can get that, I tell myself. No doubt, I can get that. The next step is teaching myself to teach more creatively and go as far outside the conventional box as your mind will let you. And this mind will let me do whatever I want. It’s my biggest ally, supporter, like a wandering cheerleader entangling and untangling my anxieties and insecurities. At this new age of 37, in fact, it’s quite eager to hunt down and kill the self-doubt if it ever steps into sight or some subtle tangibility. It’s more than an enemy to my 37 mind, it’s a bouldering threat. But we’re not afraid. And, if you feel something coming, some doubt or challenge, or collision, get in front of it. You’ll love how you feel afterward. I know, “You said you weren’t going to try to be some motivational anything…” I’m not. And if I sound that way I apologize. I’m advocating a complete absence—no, VOID, a total VOID—of fear. Fear and doubt work concertedly, often. If not all the time. You feel a fear of something, then you doubt yourself letting the fear trample your ardor. Or, the doubt morphs into a ravenous fear. Just stand up to it, all of it. What’s the worst that can happen? You fall down, you lose once or twice, or a dozen times, but you again step and step, move forward. Again, please understand: THIS IS JUST SOMETHING I’VE LEARNED. I’M NOT A SPEAKER ON THIS SUBJECT. But I can share. I’m a sharer. Maybe an over-sharer, yes, but I’m intrepid to the point of not caring, just putting my thoughts out there knowing my inner-pushes and motivations are to help someone that feels self-doubt. Plath and Kerouac both had their doubts and troubles, demons and challenges, blocks and bumbles. But they created. They brought themselves out of their nay-saying maelstroms and wrote, put books together, added to their stories with unbridled withstanding. I learn ever time I read ‘Road’, or ‘Bell Jar’ or some other Plath work. This is a dance, with me and literature, my story and paginated steps back and forth and teaching myself that I can teach myself and learn with more vocality than I did when in college. I will graduate. Soon. Be in my travels, sharing more positive pulses and peregrinations with anyone who’ll listen. If this were a Pass/Fail course, I wouldn’t even see the word ‘Fail’. What is that, anyway? Who invented that bloody word? Like those grapes outside I come into maturity, finally, at age 37. I’m not old, but I’m definitely into life, deep enough into the story where I can’t and won’t and don’t see failure. At all. I’m like the cluster outside that’s standing in the way of aggressive sun rays, saying “You don’t hurt me, you can’t burn me, you only add to me…” Or something like that… Lost my train of thought, enjoying a couple breaths at this desk and staring out at the vineyard. Oh yeah.. the Pass/Fail thing… yeah, who’s to say what’s a failure? You have all the time in the world to get what you want. Yes, tomorrow’s not promised, I get all that. But I don’t think like that. The urgency is here with me, and that’s enough. Enjoying the steady, slow, accommodating beginning to my day, with the outside vines, inside this house with my coffee, no ringing phone, my projects for the day cued up. The day teaches me something else, even more crucial in value than the breathing outside next to my car: ACKNOWLEDGE YOU’RE ALIVE. ACKNOWLEDGE THAT YOU CAN GET OUT OF YOUR CAR, BY A VINEYARD, AND BREATHE. Yes. Like I’ve said and written on my blog I don’t know how many times— ‘You know how many people in America would kill for a view like this from their desk?’ True, so I need to slow down. I offer you do the same. Just try it. Move a little slower. Don’t worry, the self-doubt and fear won’t catch you. If anything, I’ve just recently found, this makes you more impenetrable as a person, as a writer and creator. This day has also taught me that you can’t create when you’re negative, or in a mood or funk. Last night, a disagreement with someone only weighed on my thinking, and I tried to write but only paginated word-sewage. I hated what I wrote. In fact, I deleted the whole piece, close to 500 words and I never do that. Enjoy the steady, smile, be positive, and enjoy your writing fly and you away with it. Goals… I am in no way an authority to talk about goal attainment. Goals, I only just the other week developed a methodology which makes goal satisfaction more seamlessly embraceable. So I won’t even write about my “methods”, if they’re even “methods”, but I will say play with your own methods… see what works for you. Goals are great. They’re there to touch, to enjoy when you reach them. In fact, if you have some goal obtainment practice you want to share with me, believe me I’m all ears, eyes, senses and thinking. You teach me, you share with me, I’d be timelessly indebted! ‘On The Road’ taught me to just go. Don’t think, just go. Do. Overthought is writer-death I always share with students. And it is. It’s goal-death as well. Just bloody try. You won’t fail. In fact, what others so hastily tag as failure is really character assembly, and addition to Personhood and thought fortitude. Sal and Dean had destinations but more importantly they had a penchant for the journey, the travel, the Road. They were high on ‘The Road’. The Road was the pursuit, not some city. As with writing and being a creative, we do have our deadlines and projects, the manuscript and tangible we rush to complete, but it’s the process and practice that keeps us positive, keeps us mentally live and more immune to self-doubt and fear, those horrible pessimism anchors that love submission. Reminds me of this George Bernard Shaw quote for some reason, where he says, “You see things and say, WHY? But I dream things that never were and say, WHY NOT?” Just get up and go, right? No meditation or measurement, just act, just create, just run, just write, just live. Overthought in many realities is the offspring of self-doubt. So, no thank you. Happiness is the path… I remember a friend in college, undergrad, fellow English major always used to say this. Think it was a quote from Buddha, I think. But, I’ve always remembered it, sometimes say it to self while driving Dry Creek Road to work. I’ll get out there and walk, let the day and the vineyards teach me more. I have more to learn if I’m to forward as a strong creative. When out there, I’ll take pictures of what the vineyards tell me. I’ll let the atmosphere and stage’s character instruct me. I have no reason to doubt the self if the vineyard’s promulgating me, supporting my curiosities and scholastic rhythms. I know graduation’s near. Where am I transferring? The world. The whole planet. Writing in spots you wouldn’t think to write… a bus stop in Zurich, a field in Norway, a café in Egypt. Travel isn’t a goal just to be a goal and to travel, just to tell people something trite like ‘oh I travel a lot for work’. Annoying when people say that, like they’re so burdened by the flights and the hotels when they know so many would love to experience what they are. I’m on a tangent, I feel… I’m just motivated for graduation, to my next campus, passing to next stage— out there. After my walk in the vineyard with a co-worker, taking dozens of stills of clusters and the canes, the rows and soil, irrigation lines, I’m not just ‘moving’ upward, it’s become a sprint. And, I just realized, maybe this goes beyond instructional and matriculated containment, maybe it’s life, the life of a writer and style of life (not necessarily ‘lifestyle’) of a truer than true writer. Thinking and brainstorming on a separate sheet of paper from the Composition Book and I know that my first travel is close, that assurance and coated affirmation, coated in assurance from what I see around me in the vineyard and this very office, that what I want is right there. To live madly, having any self-doubt so far at my 6 that it dissipates, halts in any memory or semblance of existence. The walk was the topper, icing on cake, cherry atop, whatever cliché you insist be inserted. It’s there, here, now, with me. Like visual music and poetry. We can all have what we want, all of it, I’m just now learning. You know who, or what, or more so who is the motivational speaker today? This vineyard. That one across the street from us. All the patches and stretches and blocks I saw driving to work. It’s more than motivating, or “inspirational” for me. It’s the Road, it’s the Roman candle, it’s a story that doesn’t stop. Happiness with exponents with exponents. Today’s been like that day in the semester where you know graduation is near and you want to conclude the term stronger than you have the others. You’re strong. The feeling is a cosmic intoxicant. you can’t get enough and you wouldn’t if you could. In fact, the thought of it leaving you or getting your fill frightens you, but emboldens you. You’re going to pass to the next campus and stage in your self-education and edification in ways that you’ll yourself want to study, repeat and repeat repeatedly. You’ve acknowledged that you’re alive, your life is being written, by you— Before you say anything, I’m not in motivational mode. Not at all. I’m in assurance mode, or affirmation morphology, speaking to myself and sharing what I’ve learned and what I’m realizing about myself and what I’m capable of, with you. Creativity is life. My life. If you write or draw, take pictures, make music, make wine from the grapes out there, or express yourself with and/or through anything, then you’re lively with an alive liveliness for which you should compliment yourself. Keep creating. you’re far from that doubt, now. “Huh,” I just thought to myself, I may have a goal strategy now. And if not a rock-solid strategy then certainly a thought of one. That’s a start, right? I’m passed what was, forgetting it completely no, but moving past. It’s part of the writer’s past, which is essential otherwise I’d have no present nor future. We creatives ramble, which is precisely what I’m doing right now, a consequence of condensed inspiration, the atmospheric nudges from vineyards, views of vineyards. 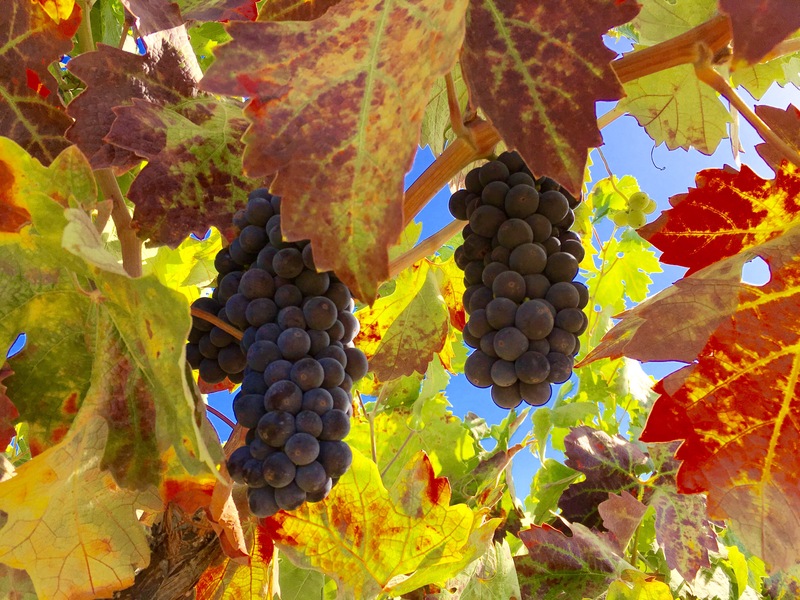 Always coming back to those grapes, the canopies, the leaves and extending canes. There’s life out there, self-life, self-education, my newest self sense.